Houston Texans’ Ryan Fitzpatrick has been seen as average quarterback capable of having good games. Many see Fitzpatrick as the weak link of the Texans. With the Texans on a two-game win streak and with Pittsburgh Steelers quarterback Roethlisberger struggling in his last game against the Cleveland Browns, the guy who wins this battle and game will help alleviate much pressure from themselves and their respective teams. This Monday night both the Pittsburgh Steelers and Houston Texans are in serious need of a win. Usually when a team is in need of a win they look to the quarterback to step up his game. If I had a choice between Roethlisberger and Fitzpatrick, I’m taking Roethlisberger. Roethlisberger has shown plenty of consistency in big game situations. Fitzpatrick has started 81 games and has 30 wins and 51 losses. Roethlisberger has 108 wins and 54 losses. When it comes to physical talent Roethlisberger possesses the size and arm talent. Fitzpatrick has talent around him with Andre Johnson and Arian Foster, but has not shown the ability to carry a offense. Roethlisberger has Le’Veon Bell and Antonio Brown and clearly can, and has, carried the Steelers offense many times. It’s clear Fitzpatrick is intelligent. But we know that in the NFL if you are limited in what you can do physically, you only go so far. If the Steelers can limit Foster’s rushing production, it will force Fitzpatrick to beat the defense via throwing more passes. When it comes to mobility, neither Roethlisberger or Fitzpatrick are known for burning defenses, but do know how to evade defenses. Whichever quarterback leads their team to a victory in this game advances to a 4-3 record. I like the Steelers’ chances in this game due to sense of urgency and the Texans’ weakness at the quarterback position. Ben Roethlisberger vs Ryan Fitzpatrick? Roethlisberger on top in this battle. 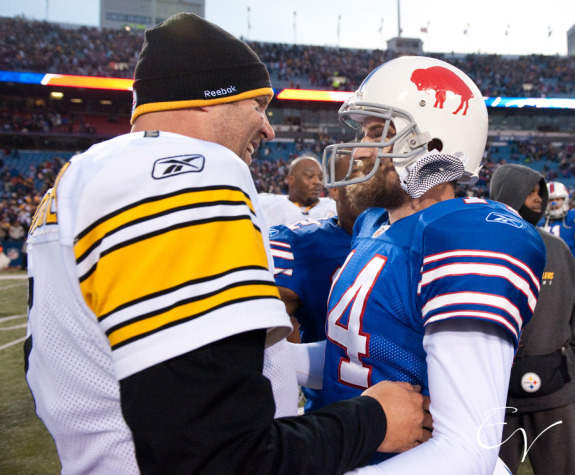 3 Comments on "How The Ben Roethlisberger Vs Ryan Fitzpatrick Battle Shapes Up"
The QB match up is a fabricated battle. Let’s talk about the real battle: the Texans front seven against our O-line, and the Steelers front seven against the Texans O-line. That’s where this game is going to won. Without being two negative , they way the Steelers line has played and more importantly one Marcus Gilbert the Steelers have a potential bloodbath on their hands . No way in the world is Marcus Gilbert going to be able to handle J.J. Watt by himself . Watt will bull rush him into the ground . This means Gilbert is going to have to have help . By doing that , its going to free up other Texans to make plays . In addition , they’re is a good chance that JaDaveon Clowney is going to play as well . At the end of the day , the Steelers line is going to have to play the best game its played all year .